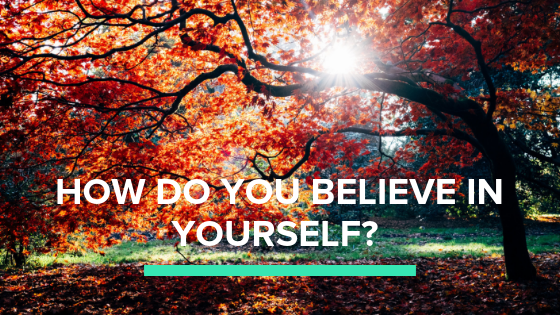 How do you believe in yourself? You realize it’s a choice. Your choice. You revoke permission from anyone who tries to oppress you, drain you, demean or diss you. You direct your attention toward what you want to do and how you wish to be vs. letting your attention zing wherever your mind or the internet wishes to take it. You educate yourself that your brain evolved to comment on your actions as a way to keep you safe, and these comments are not the arbiter of truth about you or anyone else. They are simply a by-product of evolution. You treat this voice accordingly: it keeps you out of the way of runaway trains and tigers, but it doesn’t determine what you believe about yourself. You understand there isn’t a there-there when it comes to your self. Nothing about us is fixed. You can relax with this truth that we are each an ever-shifting range of thoughts, sensations, and feelings and we are therefore free to witness this shifting self with love, curiosity, and compassion. Speaking of compassion, you get that compassion is your number one belief-in-yourself move. Your daily go to practice. You understand compassion doesn’t mean collapse or hiding or giving up but meeting yourself where you are. You allow others to see you – in your relationships, in your creative work, in your glory, in your mess – because you accept your warts, dents, and wounds AND your brilliance, beauty, and goodness as much as you do everyone else’s. You make commitments to yourself that you’re competent to keep and you keep them. When you don’t or can’t, you don’t hide from this fact. Or try to get away with anything. You seek to understand why and you begin again. You realize living with congruence and integrity are your only way forward. You embrace what a glorious mystery you are. Finally, you realize, as often as needed, it’s a choice. Your choice.